Cataract is the opacification of the crystalline lens of the human eye. It is usually related with age and is one of the leading causes of blindness. The increase in light scatter in the lens reduces the contrast in the retinal images severely degrading vision. The current solution is to perform surgery to remove the natural lens that is substituted by an artificial intraocular lens. This is a successful procedure restoring good quality of vision in most patients. However, in many situations it would be incredible advantageous to actually “see” through a cataractous eye. The optics of the eye is affected by two factors: aberrations and scatter. In the last decade, correcting optical aberrations in the eye was accomplished by using adaptive optics techniques. This permitted to obtain high resolution images of the retina and also to improve vision. 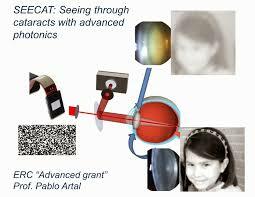 Within this project, spatial and temporal advanced photonics techniques for imaging through the turbid media of the cataractous eye will be used. We envision two direct applications of this technology: a dedicated fundus camera to register images of the retina in patients affected by cataracts and a novel type of opto-electronics spectacles restoring some vision in cataract patients.